At a glance, this skipper looks very much like its more frequently-encountered cousin, the Chequered Lancer (Plastingia naga). However, a closer look at the colour of the spots will separate it easily. All the markings on the underside of the wings and its body are yellow instead of white. The Yellow Chequered Lancer prefers shady forested areas in the nature reserves of Singapore. 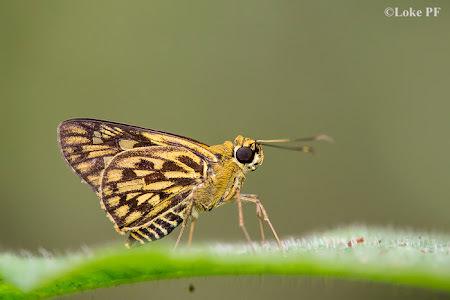 It is usually found perched on the top surface of a leaf, as was photographed here by ButterflyCircle member Loke PF. However, it can be skittish if disturbed and flies off rapidly. It tends to be affected by the camera's flash at times, jumping and flapping its wings whenever the flash goes off.